As usually, these tactics are my own and does not mean they are the most optimal. You can only attack Hymdall and Hyrja during entire phase 1. Melee on left side (attack Hyrja). Ranged stay spread from each other at least 8 yards. Hymdall and Hyrja have 2 shared abilities and 2 personal abilities. 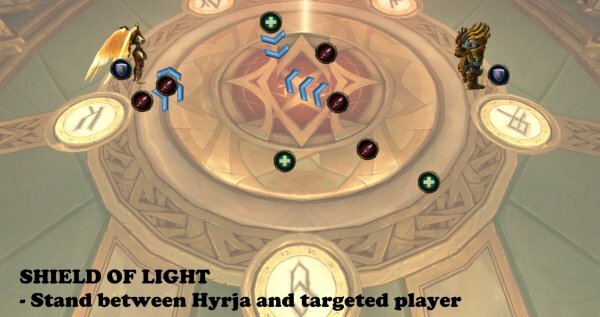 When Hymdall and Hyrja are within 35 yards of each other, their damage taken is reduced by 99%. One tank on Hymdall on left side of the platform. One tank on Hyrja on right side of the platform. When reaching 25% health, it will become immune to all damage and starts to cast a healing spell. The healing spell heals for 30% health. The only way to stop this is that both Hymdall and Hyrja reach 25% health before one of them casts the heal. Dps them down to 25% at the same time. Throws a blade towards a random player that does physical dmg. The blade begins to whirl and does high dmg every 2 sec to all nearby enemies. Hymdall does very high dmg to all enemies within 15 yards (a whirlwind attack) and causes all players to do extra dmg on nearby players within 5 yards. 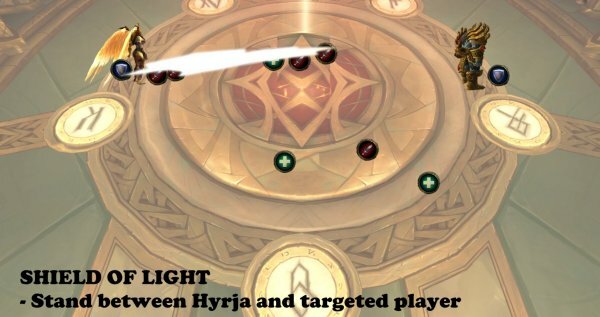 Do not attack this target, your target is Hyrja instead. 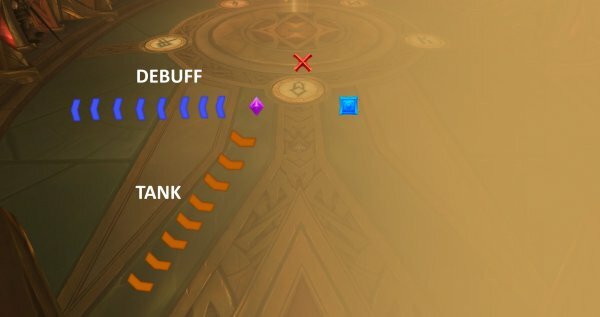 Only tank in melee range on this target. 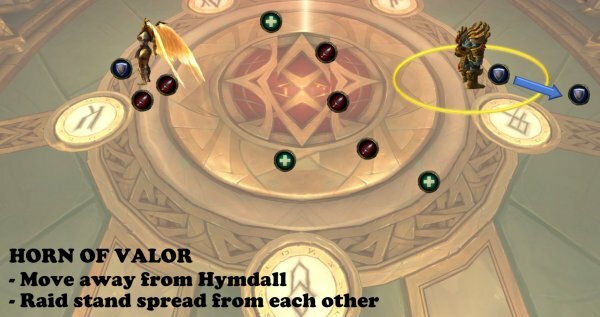 If melee have to attack this target, move away from the circle around Hymdall just before he will do the whirlwind. Run away from the circle around Hymdall just before he will do the whirlwind. Then run back in again. After 3 sec that players burst out Holy dmg to all nearby players within 8 yards. Stay spread from each other at least 8 yards. Move to the side fast, away from raid. Charges her shield and targets a random player. Launches a burst of energy towards that player and does very high deadly dmg. The damage is split between all players standing between the player and the energy burst. An arrow under Hyrja will show the location of the energy burst. Stand in front of that arrow and soak the dmg. Stand near/in front of the energy burst when possible (backup). Odyn cannot be attacked during phase 1. Odyn has an energy bar (0-100) in which it takes 30 sec to fill up to max. When reaching 100 energy he will do a blast that does high dmg to every on the raid. During this time, 5 runes on the ground will be activated. Deactivating a rune will decrease the damage of Odyn´s blast. Odyn Summons 5 adds (Runebearer) that spawns from the sides of the platform. Killing Runebearer on its specific rune will deactivate that rune. Each Runebearer targets and chases a random player. 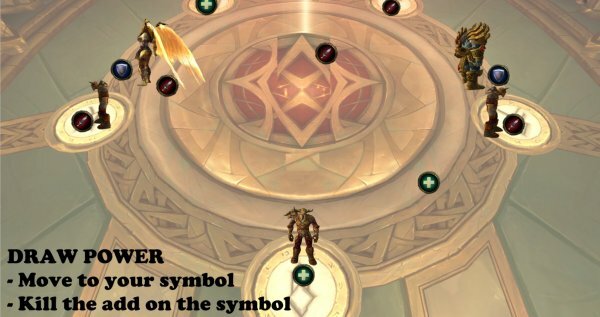 The targeted player gets a rune symbol on their head. The targeted player runs to its corresponding rune on the ground. Make sure that the Runebearer that is targeting you, is on your rune (they are immune to dmg when not on the rune). 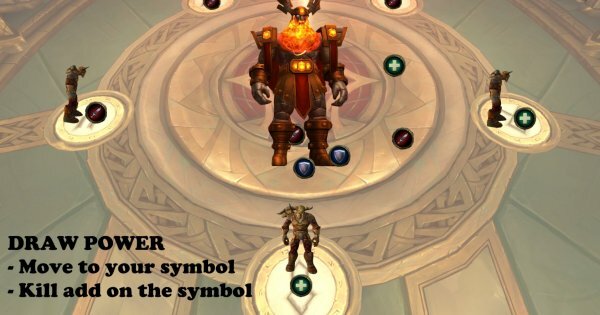 All DPS, help killing the Runebearers when they are on the rune. Phase 2 starts after taking the 2 adds/mini bosses Hymdall and Hyrja to 25%. They fly away and now you will attack Odyn instead. Every time Odyn hits the same target, he gets a stacking buff on himself that increases hit attack speed by 8%. When he attacks a new player the buff he has resets. Tank swap when the boss has 5 stacks. Heroic/Mythic: If a player touches the spear it will also shatter. Phase 3 starts when Odyn has 55% health and fight ends when Odyn has 10% health. The boss does cleansing flame and leaves 1 out of 3 areas clear from flame (Cross, Square or Diamond side). Everyone stack on the marker and tank boss on marker. 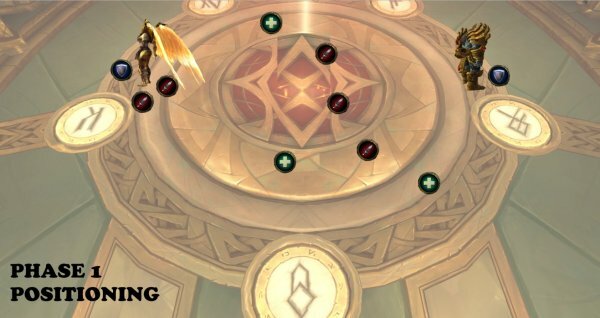 See images where to run with debuff (raid) or from spear (tank). Odyn creates flames from the ground on big portions of the platform. 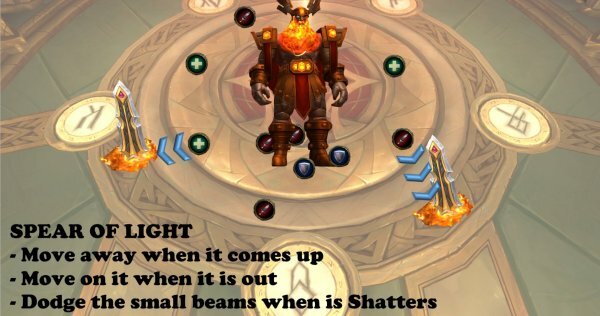 Standing on the flame does high damage every 1 sec. Tank boss on marker (see above). Odyn puts a debuff on the one tanking. 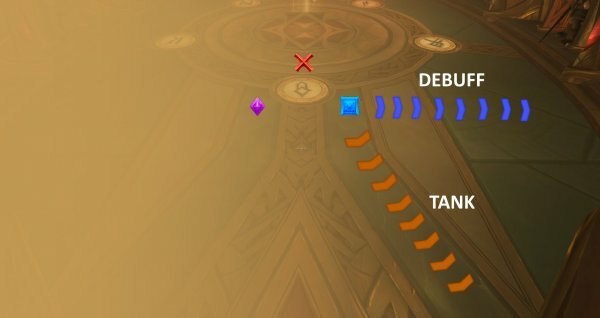 After 5 seconds that debuff will explode and the tank takes insanely high physical damage. The entire raid will also take Nature damage when the debuff explodes. The damage on tank is decreased the further away the player is from Odyn. Tank swap at each Spear. 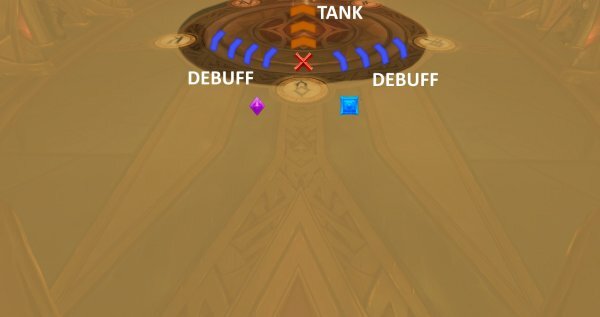 The tank with the debuff runs far away as possible from the boss (you have 5 sec), see figure above. Use defensive cooldown before the debuff explodes. Healers help with defensive as well. Odyn marks several players (a circle around you). After 5 sec, they will be hit by a lightning bolt which does dmg to any player within 8 yards. After the hit, a whirlwing will spawn (Raging Tempest). Any player that touches a whirlewind will take high dmg and tossed up high into the air. Marked players run to the side/wall of the platform, see figure above. Wait until you get hit, then run back again. Odyn shoots random players from time to time with bolt of lightning. The longer time this phase lasts, the higher dmg from those bolts. This is why you pop blood lust/time warp on this phase. You need to kill boss before bolts kill you.